SPECTRE #1. -GARDNER FOX/ MURPHY ANDERSON c/a-. We will take great care in processing your order. I grade as accurate and tough as possible-. The 1st Spectre in Showcase (1st app overall in the SA)----------------------------------------. Feature Story: The Spectre. The Spectre confronts the evil Azmodus, who has taken over the body of Paul Nevers. (Colors), Jim Aparo (Letters). Character appearances: The Spectre; Gwendolyn Sterling (Intro) ---------------------------------- Night of the Slaves (Sequence 2 - Story, 7 pages, job number J-3021) Feature Story: Captain Fear Credits: Steve Skeates (Script), Alex Nino (Pencils), Alex Nino (Inks), ?. Cover Nick Cardy. Feature Story: Spectre. Fact File #8 - The Spectre. text page on the Spectre. from DC from 1968- -------- -- - -- ---------------------------------. Hit and Run. I grade as accurate and tough as possible-. (Colors), Jim Aparo (Letters). Character appearances: The Spectre; Gwendolyn Sterling (Intro)---------------------------------- Night of the Slaves (Sequence 2 - Story, 7 pages, job number J-3021)Feature Story: Captain Fear Credits: Steve Skeates (Script), Alex Nino (Pencils), Alex Nino (Inks), ?. 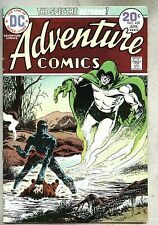 Adventure Comics #432-1974 vf Spectre / Jim Aparo-1st bronze "toyman"
(Colors), Jim Aparo (Letters). Character appearances: The Spectre [Lt. Jim Corrigan]; Earl Crawford ----------------------- The King is Dead; Long Live the King! (Sequence 2 - Story, 7 pages, job number J-3600) Feature Story: Aquaman Credits: Steve Skeates (Script), Mike Grell (Pencils), Mike Grell (Inks), John Albano Jr. (Colors), Ben Oda (Letters). Story / 8 pages Credits Script: Sheldon Mayer Pencils: Alex Toth Inks: Alex Toth --check out the pic for a great look-------------------------------------------------------------- -------------------------------------------------- ----------------------------------------------------- -. First appearance of Spectre in the Silver Age. CGC 8.0 VF Off White pages. New and flawless case from CGC. Showcase #60. Hourman appears. Murphy Anderson art inks. Spectre #6 (DC)(1968) in fine plus 6.5 condition. Nice complete copy with no missing pages and nothing clipped out. All staples attached to cover and centerfold. Showcase #60 - CGC 8.5 VF+ - DC 1966 - 1st App & ORIGIN of SA Spectre! 1st Silver Age Appearance of the Spectre (Jim Corrigan) and Azmodus! ORIGIN of the Spectre in text! Beautiful CGC 8.5 (VF ) example - Cream to Off-White Pages with Excellent gloss quality! Showcase #60 DC 1966. This comic is not professionally graded. I have attempted to take several pictures so you can see the condition for yourself. THE ITEM WILL BE IN THE EXACT CONDITION THAT IS SHOWN IN THE PICTURE. The Spectre! Comic Book #10, DC Comics 1969 FINE/FINE . The photo is of the actual copy that you will receive. A solid copy. 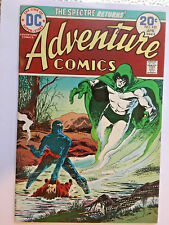 Issue Note: First appearance of the Spectre in the Silver-Age. DC COMICS | FEBRUARY 1966. SHOWCASE #60. All comics are bagged and boarded. Showcase #60 5.0 VG/FN. If I have it, I will get it listed. Spectre #2 (DC)(1968) in fine 6.0 condition. Nice complete copy with no missing pages and nothing clipped out. All staples attached to cover and centerfold. No restorations. 1st printing. The pages are tanned (Owl 6) and in nice condition. Here is a cool issue of DC comics' SPECTRE #3 from 1968. SPECTRE #3 is in Good condition. Centerfold is detached. There is a 2&1/4" by 1&1/4" crease to the lower, left, back corner. This comic is so cool! The Spectre! Comic Book #5, DC Comics 1968 VERY FINE-. The photo is of the actual copy that you will receive. A solid copy. Written by Gardner Fox. Art and cover by Neal Adams. The Spectre Interviews Neal Adams! 36 pages, full color. Grade: CGC 9.2. Published 1968 by DC. of comics, generally about 25-40 comics depending on page count. Showcase #64 VG- 3.5 DC Silver Age 1966 The Spectre!!! Showcase #64 (DC, Oct 1966) is inVery Good- condition. All pages were checked individually. All comics are sent bagged and boarded. Written by Mike Friedrich. Art and cover by Neal Adams. 36 pages, full color. This is a mid grade item. If you are not familiar with comic book grading. Published 1968 by DC. Grade: VG 4.5. Centerfold detached at one staple. From the pedigree Boston collection. Must be seen to be believed. Top certified copy! Spectre #2. CGC NM/MT 9.8 Off-white. The Spectre! 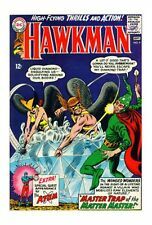 Comic Book #6, DC Comics 1968 VERY FINE-. The photo is of the actual copy that you will receive. A solid copy. Written by Neal Adams. Art and cover by Neal Adams. Letter to the editor from artist Klaus Janson. 36 pages, full color. Grade: CGC 9.2. Published 1968 by DC. of comics, generally about 25-40 comics depending on page count. 1st silver age appearance of the silver age Spectre. Showcase 60, 61 and 64. full set. The Spectre! Showcase #61 -- two copies, the best is a solid 4.5 grade, the other copy is a bit less. Showcase #64 -- purple covers from the 1960's rarely preserve and this is no exception. Showcase #60 -- spine wear and color breaks, folds along right edge a few small tears consistent with grade. Spectre #1 VG 4.0 First Silver Age Issue Murphy Anderson Art! 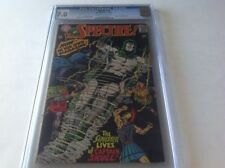 The item up for sale is aVery Good copy ofThe Spectre #1. We're happy to help! General edge / handling / spine / corner wear. Photo is actual item you will receive or (in the case of multiple. F or better (6/10 -- mid grade. Noticeable wear). VG or better (4/10 -- lower grade. ). This is a comic of Spectre! No. 2 published by DC Comics in Jan.-Feb., 1968. Showcase #60 DC Comics 1-2/66 1966 CGC 5.0 Silver Age Spectre! Signed by Tom Mandrake. 1990s series. 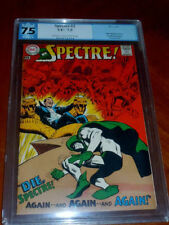 The Spectre 5 CGC SS (8.5) . Written by Mike Friedrich. Art and cover by Neal Adams. 36 pages, full color. Grade: CGC 9.4. Published 1968 by DC. of comics, generally about 25-40 comics depending on page count. SPECTRE #1 (1967) FINE+ cond. (6.5) MURPHY ANDERSON Higher Grade! THE SPECTRE #1 (DC 1967). Features a full-length story illustrated by MURPHY ANDERSON. FINE PLUS (6.5) condition. This is a higher-grade copy of this magazine with bright color and lots of the original luster.